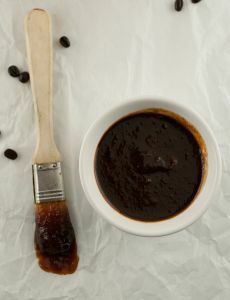 Coffee sauce is a culinary sauce that includes coffee in its preparation. It is sometimes prepared using instant coffee. Coffee sauce has been used in American cuisine since at least 1904. Coffee sauce may be sweet or savory. Sweet preparations may use sweeteners such as sugar, simple syrup, maple syrup or golden syrup. Evaporated milk is sometimes used in sweet versions of coffee sauce, and some versions utilize whiskey to add flavor. Additional ingredients utilized in some preparations include eggs and whipped cream. Sweet uses of the sauce include its use on cakes, chestnuts, flan, ice cream, pancakes, puddings, tortes, soufflés, sweet potatoes and waffles. Savory uses of the sauce include its use on salmon and steak.